Max LED bulb length from bulb face to end of bi-pin is 2" Direct-Lighting H-type track only. 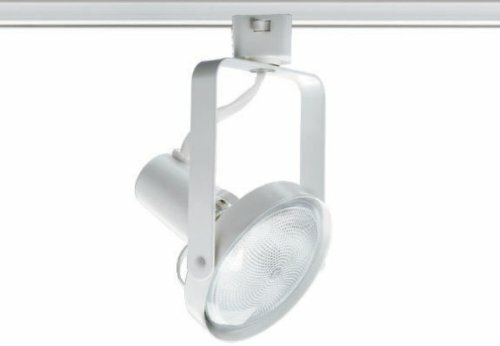 HT-50016-WH MR16 50W low voltage track lighting provides an excellent source of illumination when a concentrated and precise beam of light is required. This track head is an ideal accent lighting choice for retail store lighting, gallery lighting, display lighting, task lighting, product highlighting, and residential lighting purpose. The color of this fixture is white, the body is made with steel stamping and the transformer located inside the polycarbonate case. The attached 12-Volt electronic transformer can be used with dimmers that support 120V electronic low voltage transformer. The swivel arms provide 350-Degree horizontal rotation and 90-Degree vertical projection. This track head works with any typical H system aka 3-wire-1 circuit track system. Max LED bulb length from bulb face to end of bi-pin is 2"
Direct-Lighting PAR30 Gimbal Ring line voltage track lighting accepts PAR30 lamp. White Color is OFF WHITE. Bulb is not included. Please also check image with dimension as there is no standard in LED PAR30 size, each brand can be slightly different in PAR30 neck length. The Gimbal ring, rear loading line voltage track lighting fixture combines contemporary style and full functions. This simple and clean designed track head is an ideal accent lighting choice for retail store lighting, gallery lighting, display lighting, task lighting, product highlighting, and residential lighting purpose. 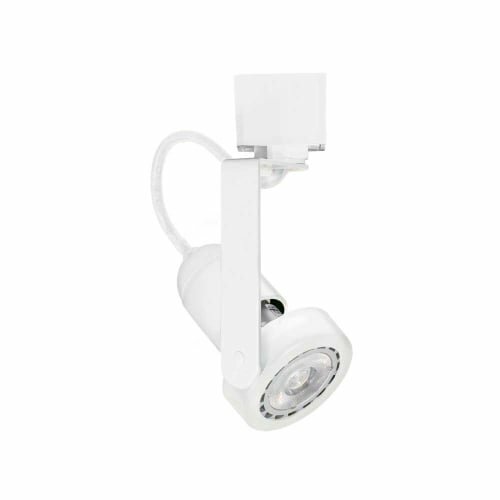 Base: E26 socket (Medium / Screw-in base) Compatible Lamp type: PAR30 Halogen Track System: Compatible with any typical H system 3-wire-1 circuit track system Wattage: 75 Watt Max Voltage: 120V Color Finish: White Listed: UL & cUL LIGHT BULB NOT INCLUDED. H system (3-wire-1-circuit) Line voltage track lighting fixture in black finish. PAR30 gimbal ring, rear loading line voltage track lighting. ** BULB NOT INCLUDED. Order lamp separately. ** 350° horizontal rotation and 90° vertical aiming. The classic designed line voltage track head is an ideal accent lighting choice for retail store lighting, gallery lighting, display lighting, task lighting, product highlighting, and residential lighting purpose. 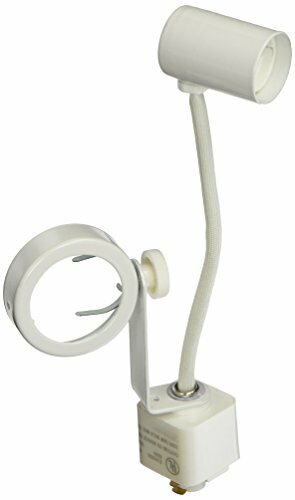 Item Number: HTC-9005-WH Track System: Compatible with H system track (aka 3-wire-1 circuit track system ) Base: E26 socket (Medium / Screw-in) Compatible Lamps: Halogen PAR30(75W max), LED PAR30 ( Please be advised size of the LED bulbs are not standard. Please check the specification of the LED PAR30 bulb before you make the purchase. 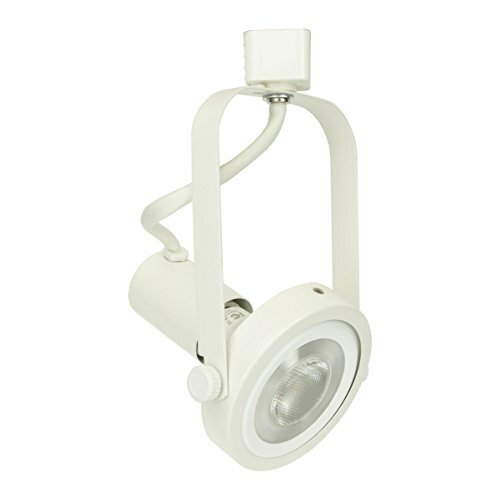 Wattage: 75W Max Voltage: 120V Finish: White Standard: ETL Listed Lamp not included. Provides warm light for your interior space. Energy Star listed. Features a multi-directional lamp head to provide light in hard to reach places. Has a dimmable function to meet desired lighting effect. Integrated LED bulb (never change). 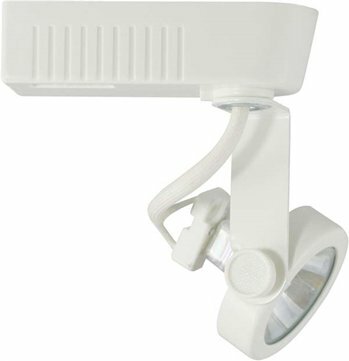 The NICOR Lighting Gimbal Ring Head 50-Watt Directional Track Light Head, White (12021WH) features triple contact connections between the linear track and the track heads. The 12021 Series is a 50W PAR20 line voltage gimbal ring track head made for NICOR linear tracks. The fully adjustable track head is perfect for accenting those hard to light areas with a modern designer look that's both fashionable and practical. At NICOR, we’re always looking for ways to make your light better. We continue to innovate, challenge our thinking and improve our processes. We look to earn your business by delivering progressive lighting solutions designed to balance value with the highest design performance possible. We’re determined to bring you reliable products that provide real solutions. When you choose a NICOR product, you can rest assured you’re getting a product that has been tested to the highest standards available. Our commitment is to be a leader of reliability, innovation, and excellence because we understand just how important you are. Track Light Head in White Finish White 1-light track / rail light. 8 in x 4.5 in. 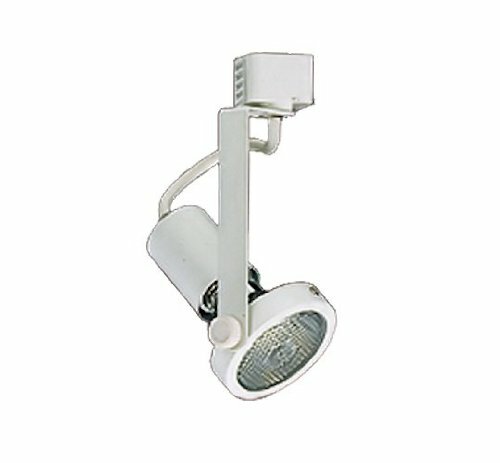 Juno Lighting Group Track Light Head in White - Steel Lighting - 8 in X 4.5 In. 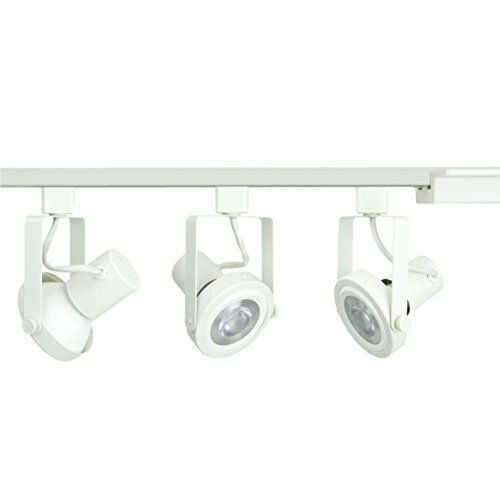 This kit includes 1 of 4ft track, 1 of floating feed canopy (power feed), 3 of track light fixtures with 3 led bulbs dimmable PAR30 14W 3000K Halo compatible system (HT), This sleek and clean designed track head is an ideal accent lighting choice for retail store lighting, gallery lighting, display lighting, task lighting, product highlighting, and residential lighting purpose. 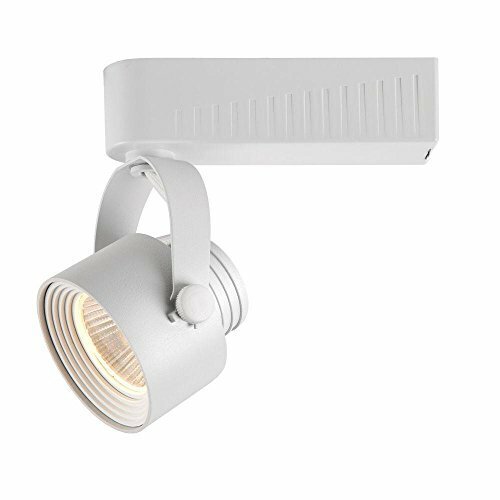 Track System: Compatible with any typical H system aka 3-wire-1 circuit track system Wattage: 75W max each head Voltage: 120V Finished: White Lamp Type:PAR30 Short Neck LED Chip: COB (Chip-on-Board) Wattage: 13W (Direct Replacement of 75W Halogen Lamp) Color Temperature (Kelvin): 3000K - Warm White Lumen: 800lu Beam Angle: 25 degree - Narrow Flood Average Hrs: 25,000 hrs Dimmable: Yes. Compatible dimmers - Lutron DVCL-153P, MA-600, D-603P, MA-600/DV-600P -OR- Leviton 6631, 6161, 6681, 6633, IP106, TT106 Listed: UL & cUL Please check your application area and specification sizes. 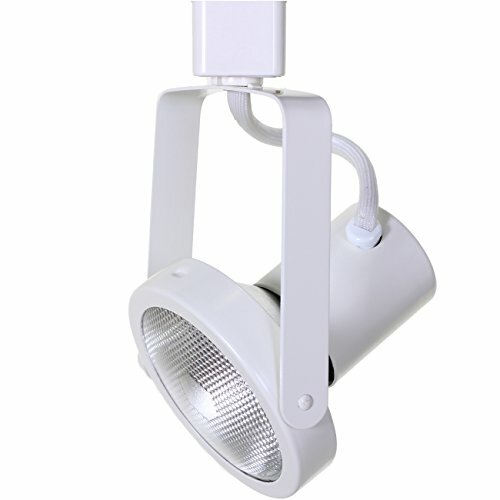 Gu10 halogen or LED track fixture in a minimal yet functional open gimbal ring design. Detailed yoke with smooth transition line. Attractive socket cover in matching color. Suitable for residential application or any small spaces with low mounting height. Compatible with most dimming protocols prevalent in the United States. Culus listed. 350-Degree horizontal, 90-degree vertical aim ADJUSTMENT. Porcelain socket, Gu10 base. Integral on/off switch. Powder coat paint. Molded polycarbonate track fitting. Looking for more White Gimbal Track Head similar ideas? Try to explore these searches: Folding Home Bar Cabinet, Leak Detector Spray, and Work Border. Look at latest related video about White Gimbal Track Head. Shopwizion.com is the smartest way for online shopping: compare prices of leading online shops for best deals around the web. Don't miss TOP White Gimbal Track Head deals, updated daily.